Moving the Al Green Resource Centre to 74 Tycos Drive, was prompted by JVS Toronto’s review of programming options for The Workshop, a sheltered workshop providing light assembly and packaging service for local businesses, and giving hands-on work-based and life skills experience for participants. Shortly after JVS Toronto began its review, the Ministry of Community and Social Services announced it would be moving away from this sheltered workshop model across the province, and transitioning them to more inclusive participant programming focused on competitive employment and meaningful community and volunteer placements. JVS Toronto took this opportunity to integrate all our disability services programming under one roof after closing the Dufferin Street location, the Al Green Resource Centre was relocated to 74 Tycos Drive joining existing disability services programs, our career, education and psychology services and all our administrative departments. Since a soft opening in June, our participants have adjusted well to both programming and their new premises, bring energy and joy to its new location every day. 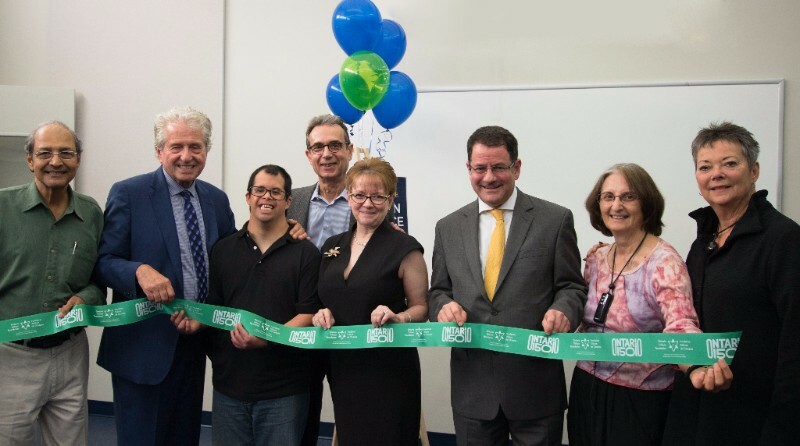 Our disability services and Al Green Resource Centre together now serve participants with developmental, learning, dual-diagnosis, Autism Spectrum Disorder and other disabilities. Honoured guests who joined JVS Toronto President & CEO, Kim Coulter and Board Chair, Jeff Goldfarb in a ribbon cutting ceremony included: David Green, Daphne Wagner, Mike Colle, MPP, Lawrence-Eglinton, City Councillor James Pasternak, Ward 10 York Centre, Sandy Stemp, Chief Operations Officer, Reena, and Al Green Resource Centre participant Adrien, and his parents Mary and Ken.